Partly cloudy skies during the morning hours will become overcast in the afternoon. High 79F. E winds shifting to SSW at 10 to 20 mph..
A van heading north on Tehachapi Willow Springs Road at Tehachapi Boulevard failed to stop and attempted to cross a part of the railroad tracks before 10 p.m. Thursday, Dec. 28, and was hit by a Burlington Northern Santa Fe freight train. This was not a designated crossing. A pair of brush fires kept Kern County firefighters busy on Wednesday around the Tehachapi area, but crews were able to get the upper hand on the fires quickly. Deputies from the Golden Hills Sheriff’s Substation arrested 41-year-old Jose Mota on suspicion of possessing more than an ounce of methamphetamine and an ounce of marijuana after leaving a house in Golden Hills while being on the Electronic Monitoring Program. A fire in Bear Valley Springs Monday night that involved a home, garage and two vehicles caused an estimated $150,000 in damage. The Kern County Sheriff’s Office is reporting deputies from Rosamond and Mojave were sent to Rosamond High School at 2925 W. Rosamond Blvd. Feb. 10 for a possible distraught student who made threats to shoot students at the school. CHP officers arrested a man after a high-speed chase, which started in Santa Clarita, ended on Randsburg Wash Road. Tehachapi Police captured an escapee Thursday who was earlier arrested on suspicion of burglary about four hours after he slipped his handcuffs and escaped from the back of a patrol car. A bomb team from Edwards Air Force Base rendered safe an explosive device driven to the Tehachapi Police Department on Tuesday by a homeowner who found it in his garage. The Tehachapi Police Department arrested 29-year-old Drew Walterkhie Kaupelis of Tehachapi on suspicion of arranging to meet a minor to commit lewd acts, exhibiting lewd material to a minor and contacting a minor with the intent to commit lewd acts, the police chief said Monday evening. The Kern County Coroner’s Office identified 25-year-old Drew Paul Masters of Tehachapi as the person who died in a crash on Highway 58 at 7:58 p.m. Sunday. A fire early Saturday at Horse Thief Country Club destroyed a storage building and all its golf carts, causing an estimated $500,000 to $1 million in damage. Tehachapi Unified School District has announced all schools are closing for today, Wednesday, Jan. 6, due to the heavy snowfall. The schools were also closed Thursday. Mudslides closed Highway 202 in the Brite Lake Valley area between Cummings Valley Road to the east in both directions to Cummings Valley Road to the west this Tuesday morning. Caltrans and the California Highway Patrol then reported Highway 202 was open as of about 11:15 a.m.
Tehachapi Police arrested a man and a juvenile Wednesday morning on suspicion of gun and drug crimes, according to information released by TPD Chief Kent Kroeger. Tehachapi Police officers arrested a man and a woman on suspicion of possessing guns and drugs in a shopping center parking lot last week. Kern County Sheriff’s deputies found about an ounce of methamphetamine valued at $500 hidden in a jar of jelly beans during a probation search in the Golden Hills area of Tehachapi, the office reported Tuesday. Tehachapi Police served search warrants and arrested a husband and wife Tuesday night on suspicion of furnishing narcotics to a minor, Chief Kent Kroeger said at the scene where the warrants were served. A woman who was stabbed Thursday morning died from her injuries on the way to Tehachapi Hospital, law enforcement officials said. According to the Kern County Fire Department, the natural gas line that ruptured in Golden Hills just before 9 a.m. this morning has been controlled as of 12:55 p.m.
Members of Tehachapi First believe the environmental impact report prepared by the City of Tehachapi for the proposed Walmart super store is flawed and will continue to fight to block construction according to spokesperson Christopher Zehnder. A home was in danger Wednesday morning when fire broke out on a hilside next to the California Correctional Institution’s main gate, located at the end of Highway 202. On Wednesday evening, June 17, the Kern County Fire Department will conduct a Night Vision Goggle (NVG) drill in the Tehachapi area. NVG allows helicopter crews to work through the night to control fires in their initial stages. The helicopters are also equipped to perform night time hoist rescues. A Wind Advisory is in effect for the passes and eastern slopes of the Kern County mountains and western Mojave desert, including Tehachapi and the Indian Wells Valley. A former accounts receivable clerk for the Bear Valley Springs Association who is accused of embezzling approximately $2,386 from the association has been arrested in Washington, according to Interim Chief Jeff Kermode of the Bear Valley Police Dept. A 20-year-old Shafter man was arrested May 22 in Bakersfield on multiple charges and stolen property found in his possession included property stolen during a vehicle burglary in Tehachapi on May 21. 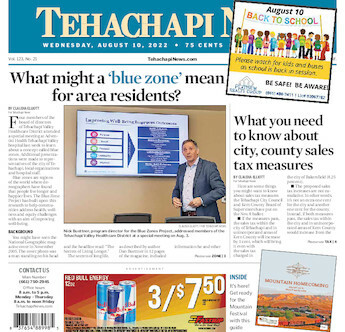 All the court paperwork has been filed and a Super Walmart in Tehachapi may actually become a reality, according to Tehachapi City Manager Greg Garrett. Good news from the City of Tehachapi — water use is going down. Hundreds of vehicles, including big rigs, were routed off of westbound Highway 58 into Tehachapi Monday afternoon as officials investigated a traffic accident that took place west of Keene just after 2 p.m.
Want to know what to do if you encounter a bear? Last year many were seen near Tehachapi residential areas, including one within the city that was killed by police due to safety concerns. An anticipated thunderstorm developed in the Tehachapi Mountains about noon Tuesday, bringing thunder, lightning and intermittent rain. The Kern County District Attorney's Office will conduct an independent investigation into an officer-involved shooting that resulted in the death of an unidentified person in Tehachapi Sunday night, according to Tehachapi Police Chief Kent Kroeger. Supporters and opponents alike will have to wait on whether the city will get a Walmart because the March 27 hearing has been delayed. Word of the possible privatization of Kern County's libraries has some people concerned about services being cut or decline in quality. Residents in the Tehachapi area will have more medical alternatives beginning this fall as Kaiser Permanente announced the opening of a facility in town. After a 6-5 victory over Garces in the finals, the Tehachapi High School Varsity Girls Softball team finished the Leadoff Classic Softball Tournament in first place. After a thorough presentation and robust discussion, the Tehachapi Valley Healthcare District selected Adventist Health as its choice to enter round two of a proposed affiliation. Two large healthcare systems responded to Tehachapi Valley Healthcare District's request for affiliations, according to an updated agenda report sent out on Tuesday afternoon, Feb. 24. A wind advisory remains in effect until 4 p.m. Saturday as the Tehachapi area and other areas of Central California hope the weatherman might be right and rain is coming. On Friday, Feb. 6, the California Highway Patrol will saturate the Tehachapi area in an effort to reduce traffic incidents and violations in high volume areas of Tehachapi. Tehachapi's inaugural GranFondo event in September 2014 has been tapped by the county's transportation authority for a regional award of merit. Tehachapi Valley Healthcare District's board of directors may tap its interim chief executive officer to fill the spot on a permanent basis at its Jan. 21 board meeting. Questions surrounding the death of a 56-year-old Tehachapi woman, Julie Mosier, who died at approximately 4:15 p.m. on Aug. 14, 2014, after being struck by a vehicle while she was walking in the 200 block of West Valley Boulevard in Tehachapi have been answered. A Winter Storm Watch issued by the National Weather Service in Hanford today has weather-watchers wondering whether Tehachapi and the nearby Mojave Desert area will have a White New Year's. Two women have been arrested in connection with the investigation into a rash of mail thefts that plagued Bear Valley Springs prior to Christmas — and the juvenile previously charged with mail theft has been re-arrested on additional charges.